Aurelio Greco was born in Catania, Sicily on March 22, 1879. His father Dr. Salvatore Greco die Chiaramonte, Marchese di Valdina, a Sicilian aristocrat, was also a fencing master but Aurelio received his education in fencing from his older brother Maestro Agesilao Greco who was an internationally renowned master of the art. 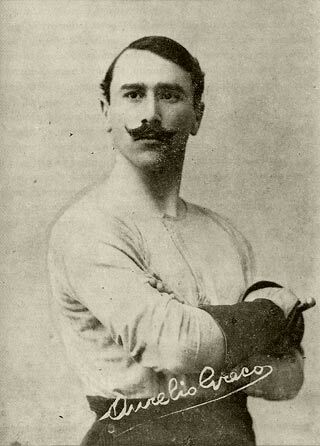 Aurelio Greco earned his fencing master diploma in 1904 at the young age of 21 at the Royal National Academy of Naples. He was active for many years as a professional competitive fencer until 1922. From then on he dedicated his life to teaching fencing at his own academy, which he founded in Rome until his death in 1954. Aurelio Greco along with his brother Maestro Agesilao Greco revolutionized fencing with the dueling sword in Italy by insisting that it was a totally different discipline from foil fencing. They designed and created a new type of dueling sword and became the leaders in the instruction of dueling sword fencing in Italy. Maestro Aurelio published the first text on Italian dueling sword fencing in 1907 titled; La spada e la sua applicazione.